A snowshoe hare hops out of the forest and into a field in Hancock County, June 3, 2014. It also means having a working knowledge of the different species that make up the family leporidae that includes all rabbits and hares because where they live is very species-specific. Rabbits and hares are very similar — they are members of the same scientific family leporid. They are easily recognized by their large hind feet, large ears, twitchy noses and fondness for hopping. But there are some key biological and behavioral differences separating the two into scientific genera, according to the National Wildlife Federation. Rabbits tend to be social burrowing mammals with long ears, long hind legs and short, bushy tails. The most common rabbit in the United States — the one most often kept as a pet or raised for meat and fur — is the European rabbit (Oryctolagus cuniculus). As adults, hares are larger than rabbits with longer hind legs and longer ears. At birth a baby rabbit — known as a kitten or a bunny — is furless, blind and completely dependent on its mother for survival and easy targets for predation. Hares, on the other hand, are born to run from birth. A baby hare — or leveret — is born covered with fur, capable of sight and hopping around on its own within an hour or two. A rabbit will remain the same color all year, while hares like the snowshoe hare transition from brown in the summer to white in the winter. Rabbits live in groups called colonies in underground warrens, where they can hide from anything hunting them. These underground systems of tunnels are dug by the rabbits and can be found in forests, grasslands, meadows or deserts. The only time a rabbit does not live in a warren is for about three weeks after it is born. Mother rabbits will dig a special nursery burrow for their babies outside the warren and cover it with twigs, grasses and even fur plucked from her own chest. When she leaves her babies, she covers the burrow with dirt to keep them hidden and safe, according to information provided by the Arizona Sonora Desert Museum. 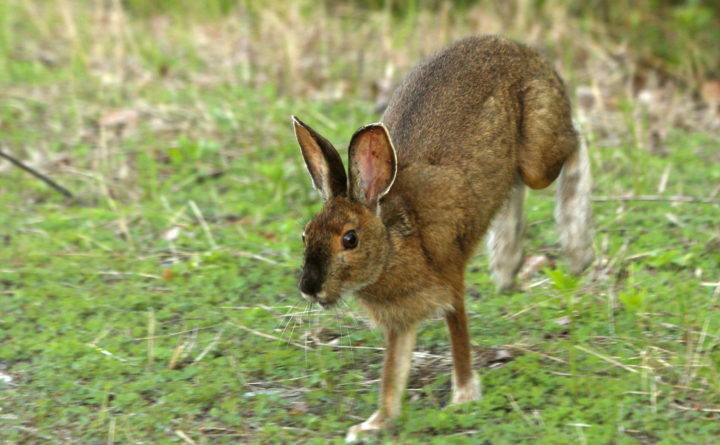 The exception to this rabbit warren rule is the cottontail rabbit, according to Kattie Bishopp in the online magazine Science. Cottontail nests are simple depressions in the ground they will scratch out and line with grass or straw. But, in general, rabbits like to go underground, and for good reason. Since a rabbit is a favored prey animal for coyotes, foxes, snakes and owls, many are killed within their first year of life. For defense, they rely on their good eyesight, good hearing and ability to run quickly back into their underground homes to hide out. Hares have evolved to live in some pretty extreme conditions, from the frigid tundra of the far north to the heat of southern deserts, and their living arrangements reflect that. In colder climates, hares like the snowshoe hare or arctic hare will dig shelters into the snow. Normally solitary animals, these hares will gather in small groups and huddle for warmth in these snow shelters. Jackrabbits — which are actually hares — live in the deserts of the southwest U.S. and in Mexico. Recognizable by their elongated ears that help dissipate body heat and their massive hind legs which allow them to run at speeds in bursts up to 40 mph, jackrabbits will rest during the heat of the day in shallow depressions in the shade and forage for food at night. These desert dwellers will gather in groups so they can warn each other of any impending dangers or threats. Where do domestic rabbits live? Rabbits kept as pets typically inside the home, either in a cage, roaming free or a combination of both. A rabbit cage should be at least five-times the size of the rabbit so it can stretch out and stand without bumping its head. Your rabbit will likely spend the bulk of the day in its cage since rabbits sleep during the day. The cage should be lined with cardboard and include a litterbox for the rabbit to use, much like a cat. Pet rabbits need several hours a day of exercise outside the cage to run, jump and explore and that can be a great time to play with and interact with your pet. Just make sure you remove anything they can chew — like electric cords, toxic plants and cleaning products — before letting them hop around freely. Rabbits raised for meat can live in a barn or a shed and should be set up in a secure cage or hutch. Their cage or hutch should be lined with straw on the floor and cleaned out once a week with the old straw replaced with fresh straw. The rabbits should always have plenty of clean food and fresh water, shade and good ventilation. Wild or domestic, rabbits and hares have evolved to survive in their unique and species-specific habitats. And humans have evolved right along with them by domesticating them for food or companions. So, next time you are hiking in the desert, snowshoeing in the north or walking in a city park, keep your eyes peeled, because the one fur-bearing mammal you are most likely to spot in all those habitats is a rabbit. Especially when you know where rabbits live.